AplexHost Review 2019: Is AplexHost a Good Hosting? AplexHost provides shared, cloud, and VPS hosting for customers in the U.S. and Europe. Currently, they are hosting over 100 websites. AplexHost provides shared, cloud, and VPS hosting for customers in the U.S. and Europe. Founded in 2013 and now based in Tampa, Florida, AplexHost offers their customer base an affordable and easy-to-use hosting platform. Small to medium-sized businesses will especially enjoy their no-contract shared and cloud hosting packages, which bundle flexibility with their in-house website builder to empower businesses to get their websites up and running in no time at all. Application updates are handled automatically on the backend, and they run regular security audits and malware removals for your hosting account. Plus, if you’ve already got an existing website with a different hosting provider, AplexHost will migrate your website for free — a service you sometimes have to pay for with other hosting providers. AplexHost also offers specialized e-commerce and WordPress hosting packages. The former affords you more space and bandwidth, though it also comes with a heftier price tag. The latter has infrastructure specially optimized for WordPress installations, so websites under this package run faster and more efficiently. However, AplexHost doesn’t seem to have a dedicated team of WordPress experts available to resolve any technical or application-specific issues, so you should bear this in mind if you’re looking specifically for a WordPress hosting provider. 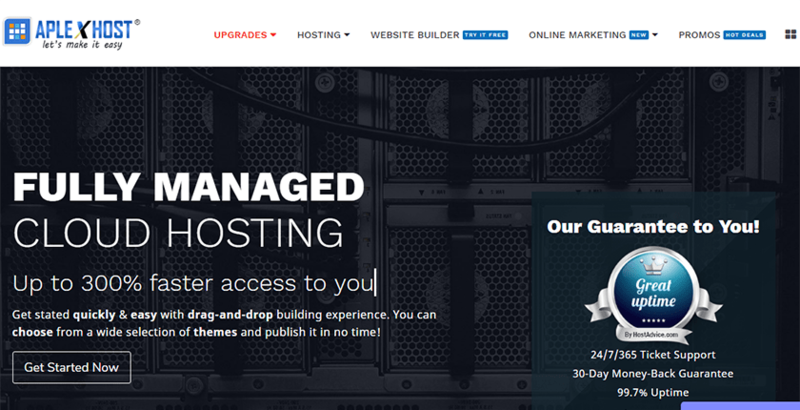 All in all, AplexHost is excellent for both beginners and pros. It’s super easy to use, especially with their bundled browser-based website builder and cPanel installations. The storage space given isn’t the most generous, but should be adequate for a basic and mostly static website. What I found particularly worthwhile was that they bundled a website builder and SSL certification with all their hosting packages. This will definitely appeal to beginners looking to set up a website for the first time. While AplexHost does not have a free trial or plan available, this isn’t a big problem. They have a 30-day money back guarantee with no questions asked, so in the event you’re not happy with their services anytime within a month, you can easily get your money back. Upgrading or downgrading plans is easy. All you have to do is open a ticket from your client portal, and their support team will take care of the rest. While AplexHost’s customer service options are not the most versatile, they do have 24/7 ticket and text support — the latter was an intriguing option, perhaps particularly popular with millennial customers. They update ticket statuses in real-time, so you always know the progress on any issues you raise. They also have a live chat available, though this is only accessible via the client portal. Similarly, their knowledge base is only accessible after you log in. With their bundled beginner-friendly value-added features, individuals and small business owners would be hard-pressed to find a better deal elsewhere. Larger corporations, however, may need to find an enterprise-grade alternative. Wondering how AplexHost stacks up against other Web Hosting companies? Enter any other Web Hosting company and we will give you a side-by-side comparison.